If you didn’t know any better, you’d think that everyone should be getting a tankless water heater. They’re fast, they’re small, they’re convenient… But we don’t want you to install a water heater just because you’ve heard a few good things. When you make a commitment on a water heater, you need one that works for you. In this post, we’ll help you determine if upgrading from tank to tankless is the right decision for you. When you first had your tank water heater installed by a plumbing company in Allen, TX, it was installed based on the number of people in your home and your estimated average usage. Tank water heaters come in different sized tanks just for that purpose. However, if you’ve substantially lessened the amount of water that you’re using, you could be letting your tank heater fall victim to standby heat loss—thus increasing your heating bill every month. Standby heat loss occurs when the hot water in your tank sits there without being used. The unused water can’t retain that heat forever, so it slowly dissipates before it can be used, only to be reheated again later. If you have fewer people in the home or have dramatically changed your water usage habits, a tankless water heater might be a logical replacement for you. Continuing on the above note, a tankless water heater, in general, can help you lower your energy costs. This is because tankless water heaters operate as “on-demand” systems. Instead of storing hot water for eventual use, tankless heaters only activate when you turn on the hot water or use an appliance that requires it. This new approach will gradually reduce your monthly energy bill and the benefits will become clear. However, you should assess your current water usage habits to make sure that this is truly the best decision. If your family’s water usage really does make sense with your current tank water heater, you may actually be limited by the tankless heater. This is due to the simple fact that tankless heaters don’t have a tank—it’s easier for them to become overwhelmed if too many appliances demand hot water at the same time. Are you moving to a smaller home? Or just looking for more ways to use the space you already? One way that helps is by removing the big bulky water heater in your garage. 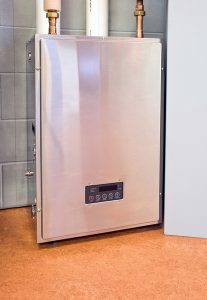 Tankless water heaters are substantially smaller, typically less than two feet tall and a foot wide (although this size may vary). And did we mention that they’re wall-mounted, either indoors or outdoors? Compare that with a tank water heater which can be about 2 feet wide and almost 5 feet tall, and forced to take up living quarters in the corner of your garage. If you’re moving to a smaller home, leave the tank water heater behind and opt for the tankless model. Still not sure if tankless is right for you? We can tell after assessing your home and your needs. Contact Hutchins Plumbing & Air Conditioning today to request an estimate.